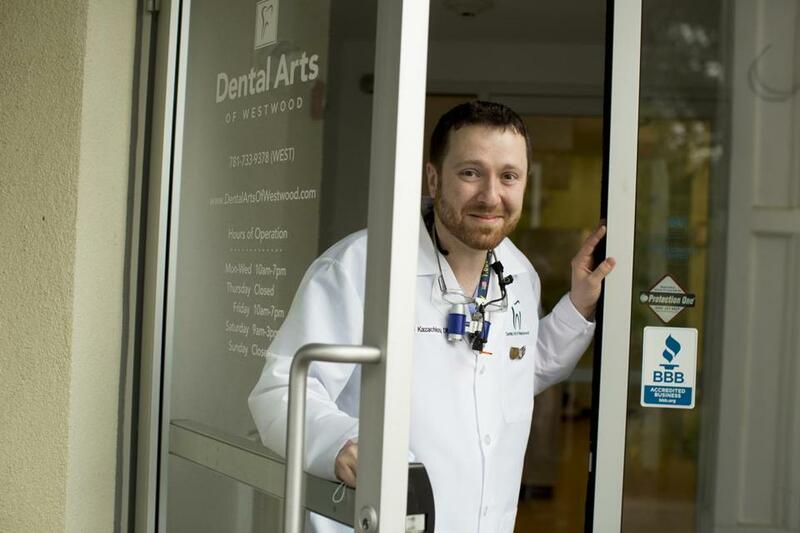 Dr. Dan Kazachkov, 34, owner of Dental Arts of Westwood (www.dentalartsofwestwood.com), practices what he calls “painless dental treatment,” for good reason: Growing up in Moldova, Russia, he once underwent a root canal without anesthesia. That led him to become a dentist, coming to the United States with his family in 1990, attending Tufts University School of Dental Medicine, where he met his wife, Shauna, a Navy dentist, and opened his solo practice three years ago. Q. What was a root canal without anesthesia like? A. It hurt like hell. It was four hours long, and my mom lost consciousness before I did, in the waiting room, listening to me scream. This was the days in Russia before anesthesia, and I kept thinking, please pass out, which I did. I can still feel that pain, and to this day I hate going to the dentist, and she’s my wife! Just kidding. Q. Why did your family come to the United States? A. We were Jews in Moldova at the start of a civil war and were easy targets. When a man who lived behind us was killed and his body thrown into a sewer, my mother said, “We can’t live here anymore.” My dad had a good job, and he left behind the ability to make millions of dollars. But no matter what, we have it the best in this country. Q. Your website says you have celebrity patients. Names, please? A. No, confidentiality won’t allow it, but I will say we have one member, and a family member, of the cast of “Orange Is the New Black,” a retired Kansas City football player, a couple of journalists, CEOs, corporate people. And a bunch of doctors and neurologists who think they’re celebrities. Q. Does your sense of humor help in your work? A. My personality helps in a field where people often come to you not feeling well. I was a joker in school, but had great grades. Q. Best advice for patients? A. Get a Sonicare electric toothbrush; it’s the best. And brush and floss. Look, the mouth is the dirtiest hole in the body by 1,000 times more than what you may be thinking. There are bacteria in it all the time. If you get a huge redness on your stomach, you’d run for help. But in the mouth, no one considers it because you can’t see it. A recent study showed that 65 percent of heart attacks and cardiac disease can be linked to periodontal disease. Take care of your mouth and you can avoid a lot of problems.